New at HSSL: Adjustable desks! 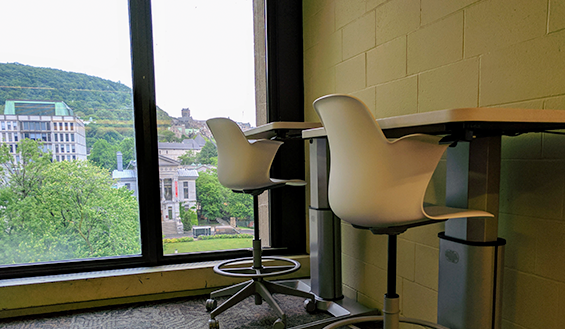 For those of you who prefer to study or work at a standing desk, you’ll be glad to know that we’ve installed 24 adjustable desks throughout HSSL. Drop by next time you are on campus, give them a try, and let us know what you think! We would like to thank the Arts Undergraduate Society for their generous support in funding this Library improvement initiative. Please note that all Library branches, including HSSL, will be closed in observance of two statutory holidays. For a listing of summer opening and service hours for HSSL, please click here. The main entrance to the Humanities & Social Sciences Library (i.e. 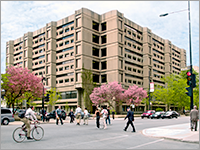 the McLennan Library Building doors off of the terrace) will be closed from Monday, June 19 through Thursday, June 22 inclusively in order to repair the grills and flooring at the front entrance. 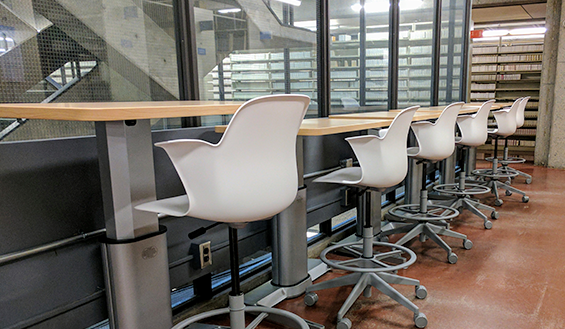 During this time period, temporary access to the Humanities & Social Sciences Library will be provided through the Redpath Library Building doors. The McLennan doors and the interior stairwell from University Services on the street level will be cordoned off and signage will be used to direct user to the Redpath doors. We apologize for the inconvenience and thank you for your patience and cooperation.